At FGCI, we carry many, many products to help everyone from the huge manufacturer down to the weekend warrior. We cater to everyone in-between with all of our products, and adhesives are no different. If you need something to stick to something else, we have many different options to help you. Considering picking the right product is so important, let’s go over some of our bigger sellers so you will know what is right for you. ASI cartridges offer two sizes; 490ml cartridges and 50ml cartridges. The two sizes allow for multiple kinds of jobs and the adhesive adheres to most surfaces, with the exception being Poly Vinyl Chloride (PVC). The 50ml cartridges have a very affordable dispensing gun and offer a very good ease of use. With the cartridges, you will need to purchase the dispensing gun and the mixing tips, which may be a bit pricey to start, but the results make up for the cost. You have working times from 10 minutes all the way up to 40 minutes. With the ease of use, and the in-expensive adhesives, ASI is always a top-seller. We also carry a line of 2 oz bottles of adhesive that mix in the tube and have a near-instant cure-time. We carry Pliogrip in 490ml cartridges and the product offers quick working times of 5-8 minutes, up to a 24 minute working time. The product uses a different mixing tip that works very well and their bonding is extremely good. Like the ASI product, you need to purchase a dispensing gun and mixing tips. The dispensing gun can be a bit pricey, but in this case, you get what you pay for, in a very dependable, consistent product. This aerosol spray adhesive is great for upholstery or interiors. We offer the product in the standard aerosol can in clear and red, which is great for standard consumers, but this product also caters to the large manufacturer and offers a 22 liter tank that fits on a backpack rig that makes things easy for bulk jobs, and allows for mobility. Superbond is a two-part, 1:1 epoxy adhesive that has a Vaseline consistency. The product adheres to nearly everything and is a favorite among wood-workers. It’s offered in a fast curing agent, giving 8-15 minutes of working time; a medium, giving 20-30 minutes and a standard, offering 30-45 minutes. 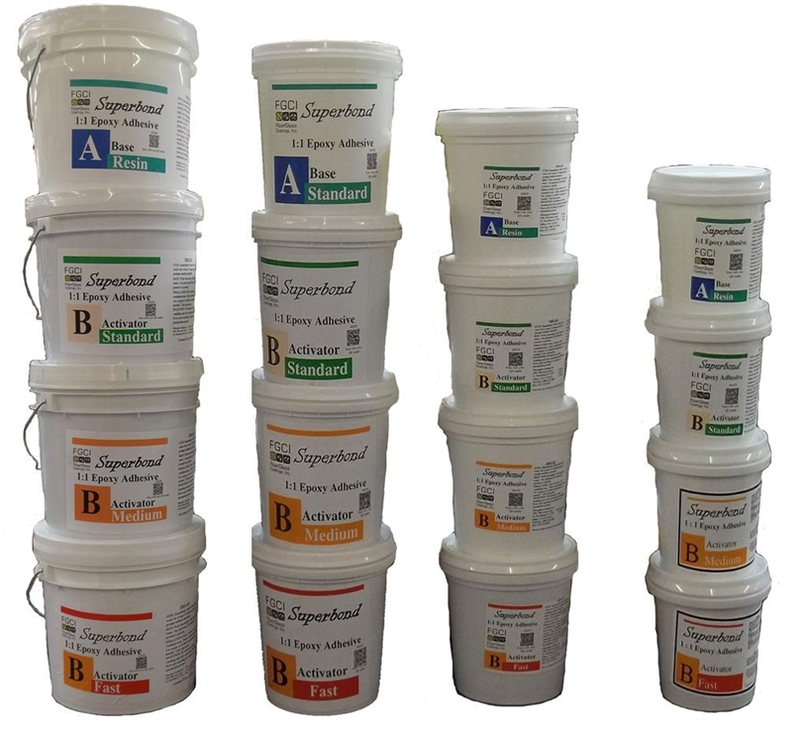 SuperBond is offered in sizes from ½-pint tubs all the way to 5-gallon pails. We carry a wide range of Loctite super-glue bottles for the hobbiest that will adhere to anything from plastics to fiberglass. This is just a sample of our adhesives. If you need something bonded well, we can match your job to the right product. 1. Our Superbond Adhesive is a two component 100% solid epoxy resin system designed for adhesive bonding and the “fitting and fairing” of a wide variety of substrates including wood, metal, glass and composite plastics. 2. Our standard activator has a working time of 50 – 60 minutes at 77°F. Full cure time is 8 hours. 3. Our medium activator has a working time of 20 – 30 minutes at 77°F. Full cure time is 4 hours. 4. Our fast activator has a working time of 8 – 10 minutes at 77°F. Full cure time is 2 hours. 5. If the product has cured hard and tack free, a light sanding and solvent wash may be necessary before re-coating.